A little girl who is determined to strike a blow for nonconformity manages to arrive at school every day with a hairdo more outrageous than the day before. And each time, the cast of copycats grows and grows --- until the day she threatens to shave her head! The strong female voice will speak to many, asserting the importance of individuality and independent thought. For more Mighty Girl stories that emphasize the value of being yourself, visit our Individuality section. 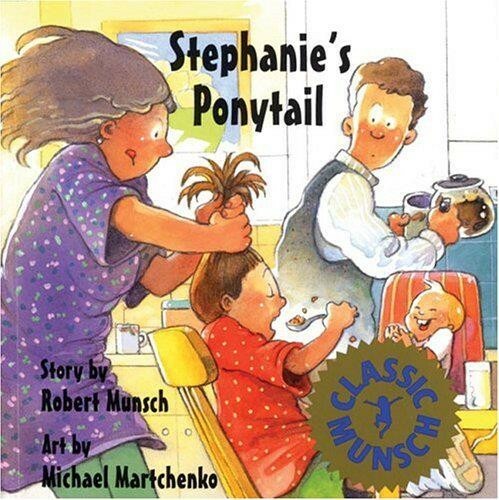 Robert Munsch is the author of more than 25 books for children including The Paper Bag Princess and Stephanie's Ponytail. He was born in Pittsburgh, Pennsylvania and studied to be a Jesuit priest before deciding to work with children instead. He taught in a variety of nursery schools and daycare centers while he earned an MA in Early Childhood Education. In 1975, Munsch and his wife, Ann, moved to Guelph, Ontario. The Munschs have three children: Julie, Andrew, and Tyya. Michael Martchenko has illustrated over 30 books for children and has exhibited his work throughout North America. He has won numerous awards for design and illustration. He lives with his wife, Patricia, in Toronto.